A New Year promise to myself is to put a stop to my ever expanding cookbook collection that is enveloping my husbands book shelf space that contains his adored novels. This means ditching some of my less used, but much loved collection, which is actually akin to removing some of my teeth. Will it be the Women’s Weekly series? I still haven’t cooked the Devilled Brains with a Breadcrumb Top or the Fish Kedgeree. I still dream of working my way through each and every one of Margaret Fulton’s best works ever. It’s another perfect rainy day, so with a Christmas leftover bar of Lindt for inspiration, and Verdi’s La Traviata punching out on ITunes, I painfully make two book stacks - keepers and throw-aways. Where did I get my copy of The encyclopedia of World Cookery from? I flick to page nine, where it says readers can learn to use the cheap staple foods of other lands, exotic foods such as Italian pasta, and experiment with them. Wow, I might just go crazy, lose my head and try that dish! And there is my beautiful green leather bound copy of Cooking For Young Homemakers, edited by Ruth Berolzheimer in 1958, that’s cast meekly to the side. Some of its more endearing chapters read, Father Carves the Fowl, The Twosome at Dinner, and the Pie Baking Award at the County Fair. The smell of this book and the yellowed pages, some with smeared food stains, are the reasons why they are still with me after many years. Then there were the magazines! It seemed that during the 1980’s Australians had unlimited access to imported foreign journals. It must have been the golden age of magazine madness: piles of Paris-Match, Country Life and Madame Figaro obscured coffee tables, the floor, and the tops of toilet cisterns. You were thought to be very cosmopolitan if you subscribed. I have recipe clippings from these magazines stuck to old bits of paper falling out of the back of recipe books. These stay in the keeper pile. So, sorry Claudia, Ruth and even Women’s Weekly, but I can’t bear to bail out and throw you to the recycling bin destined for a worm farm or far worse, made into cardboard boxes. I will just have to gain another bookshelf to make more space, adding to that stack of recipes that I must cook one day. This said, there is one book that does make its way with operatic catharsis, to the stack destined for a second hand book shop: the Original Tennessee Homecoming Cookbook of 1981, with the handwritten message in the fly leaf, Dear Anne, Hope that you enjoy this book. Happy Cooking! Love Marge and Judy. This is a book I can live without and have no further use for it, but maybe someone else can. But it’s when I stumble across my edition of Claudia Roden’s Picnic Fare that I am reminded that we still cook many popular recipes from those eras and that not many of them are truly new. 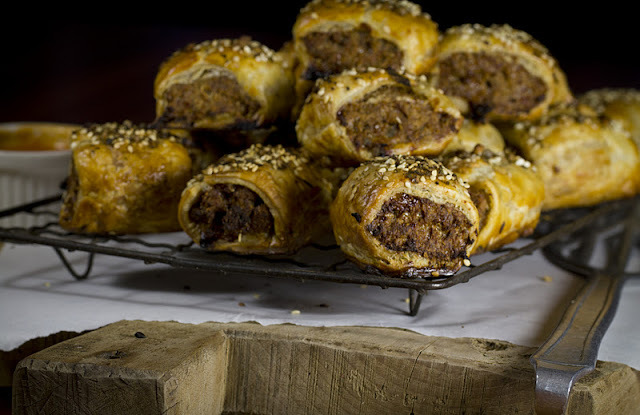 My popular sausage roll and spicy tomato sauce recipe that was always a hit when the kids had friends over, has only recently been updated to include some dukkah and spice. So, with a last nibble of the Lindt, it’s time to prepare my sausage rolls to take to the Australia Day picnic in the park. Preheat the oven to 200C. Combine the mince, 2 eggs, breadcrumbs, Worcestershire sauce, tomato paste, paprika, nutmeg, oregano and salt and pepper. Place the pastry sheets on a floured surface and cut in half lengthways to give you six lengths of pastry. Divide the sausage meat mixture into six equal portions and place a portion down the centre of each piece of pastry. Brush the pastry on each side of the meat with a little of the egg and milk wash to ensure the pastry seam sticks together when rolled. Roll to enclose, placing the pastry seam down. This will prevent the seam splitting open during cooking. Cut the sausage roll pastry lengths into quarters, and place on a baking tray lined with baking paper. Brush the top of each sausage roll with the egg wash and sprinkle with dukkah or sesame seeds. Bake for 25 to 30 minutes or until crispy and golden. This quantity makes about 20 rolls. For the tomato sauce, while the sausage rolls are cooking place all the ingredients into a shallow tray and toss to combine. Place in the oven with the sausage rolls and cook for 25 minutes, shaking periodically to prevent sticking. When the tomatoes are soft and a little wrinkled, remove them from the oven. Discard the bay leaves and place the contents of the pan into a small bowl. Using an electric processor, blend all the ingredients to a smooth paste. If you prefer you can then strain through a sieve to obtain a smoother sauce. Season to taste and serve with the sausage rolls. You can add a small amount of sugar or chilli to taste if needed, depending on the sweetness of the tomatoes.